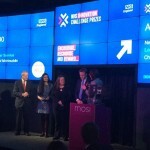 It was announced today that the London NTS Neomate app has been awarded the NHS Innovation Acorn Challenge Prize. Dr Syed Mohinuddin (NTS Consultant), and Dr Chris Kelly (Paediatric Trainee) accepted the award yesterday at a ceremony at Manchester Museum of Science and Industry along with the other four award winners in their category. Dr Mohinuddin said “the Neomate app is about improving care and safety for some of the smallest and most vulnerable patients in the NHS. This award recognises at a national level the hard work that has gone into developing this app which will be given away for free.” Dr Kelly added “the app supports staff in the important steps of early management, providing reassurance and reducing their stress levels, helping to ensure that all babies receive the best care possible regardless of where they are born”. 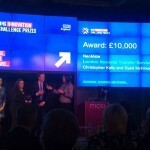 You can read more on the NHS England news story and on the NHS England Challenge Prize site.